Moreover, typefaces could substantially differ in their quality. A lot of popular free Mac fonts that you have by default, such as Arial, Verdana, Times New Roman, Courier, were optimized for the screens back in the 90s and never updated since. Now that we have ubiquitous Retina and HD resolutions, they show their age more than ever before. So what do you do? The quick answer is find and add fonts to Mac that are original, haven’t been dampened by overexposure, and have been designed for the modern times. We’ve come a long way from the 80s and 90s when only a handful of typefaces were designed or redrawn for the screen. Now we have hundreds of thousands. Not all of them are good, which is why you have to research and try out different options. Search for free Mac fonts, which would yield hundreds of predominantly low-quality options floating around the web. Google Fonts is in this camp. Visit a type aggregator store, selling a variety of fonts from various type foundries. Good examples include FontShop and MyFonts. Buy fonts from the type foundry or type designer directly. There are thousands, but to start take a look at Monotype and Hoefler&Co. If you’re a designer working on a project, it’s a good practice to give that project a somewhat unique font rather than use one of the pre-installed ones. It will elevate your designs and help the product or service stand out in the already crowded marketplace. Truth is to work with fonts you don’t even have to be a designer. Developers, for example, could make their work much more enjoyable by switching the default font in Terminal and their text editor of choice to a professionally designed monospaced option. Likewise, marketers could take advantage of a professionally designed typeface to make their reports and presentations a much more pleasant read. So what do you do after you’ve scavenged the web for something you like? How to download fonts on Mac and then how to use downloaded fonts on Mac after that? First of all, whether you’ve bought or found a typeface on the web, make sure to locate the file you can download. 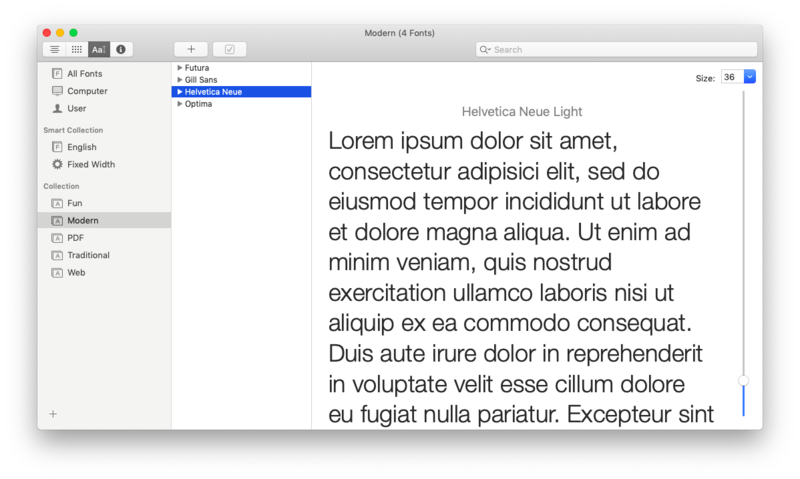 There are a variety of font formats, and some of them are incompatible with Macs. What you should be looking for is either .ttf (TrueType developed by Apple and Microsoft) or .otf (OpenType developed by Microsoft and Adobe). Sometimes you’ll see the new .woff or .woff2 format that has been specifically compressed for the web. Unfortunately, it doesn’t have a widespread support yet, so save it just in case, but keep in mind .otf and .ttf are going to be your go-tos. 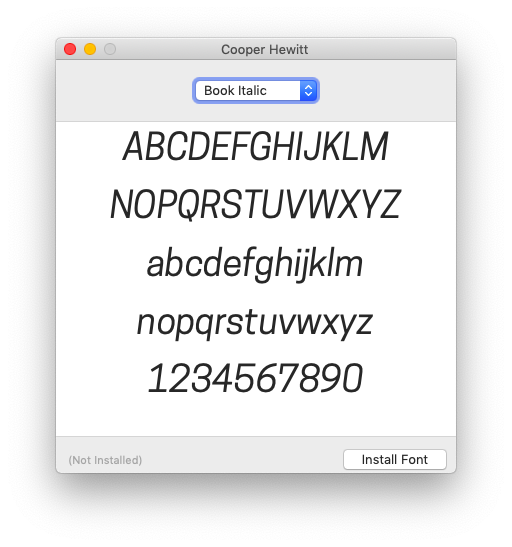 Once you’ve downloaded what you like, installing fonts on Mac is a no-brainer due to the handy app that you already have pre-installed: Font Book, which you can find in your Applications folder. With time, your collection of fonts will grow. Naturally, Font Book makes it easy to keep track and manage all your typefaces. When you open the app, all the default typefaces can be found in the Computer tab, and everything you’ve downloaded since in the User tab. In addition, you can combine various fonts together in collections (for a specific project, for example, or based on style). To do that, just click on the plus sign in the bottom-left corner, name your collection, and drag the appropriate fonts right in there. For previewing fonts, you have three options you can choose from in the top bar: Sample, Repertoire, and Custom. Try it out and see whether you like text more or just the given font alphabet. Additionally, you can adjust the size of the preview font in the top-right corner. However, if you want more flexibility and features, Font Book is not the best choice. Instead, try using a professional font manager like Typeface. Typeface repeats all the functionality of Font Book but also adds a lot of flexibility on top. For example, the app lets you choose your own text for previews, so you can see exactly how your headline or text will look in a given font. You can also turn on Night Mode and see the font in white on black background. If you’re working on the project destined for print, simply print out all the type specimens with File ➙ Print. Similarly, to see how exactly two fonts differ, right-click on one and choose Compare. 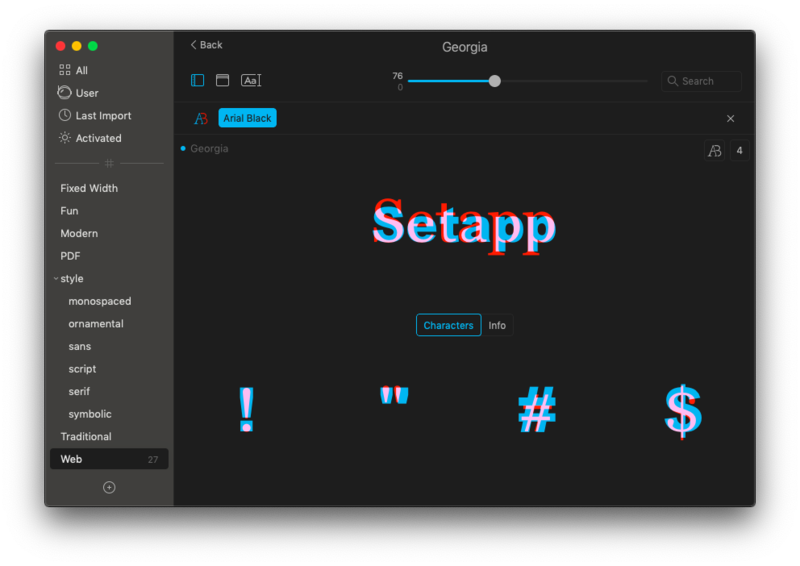 Installing fonts on Mac will significantly expand your creative possibilities and make your projects much more approachable. But to push your creativity even further, why not do the same with colors? Aquarelo is by far the most intuitive and advanced color manager around. The app allows you to pick two colors and create any number of gradations between them. Then export any swatch you liked, either as a .jpg or CSS or any programming language, so you can use it in your projects right away. To bolster your creative expression, Aquarelo even allows you to import images and pick the colors out of them. To do that, just press ⌘ + I, choose an image, and pick two colors to create a series of tones. Use plus and minus signs at the top to increase or decrease the number of mid-tones as you see fit. Now you that know where to get and how to add fonts to Mac, explore the web and actually support independent type foundries by buying and using their fonts. And then compare and manage them all in Typeface. Besides, always keep an extensive library of colors you like on hand to inspire you. Play and discover new color combinations and save them all through Aquarelo. Why hand-write all your code when an app can do it for you. Best of all, both Typeface and Aquarelo are available to you on a free trial through Setapp, a platform of over 130 design-focused apps created to make your creative life easier. Now that you have the perfect toolkit, let’s get working!